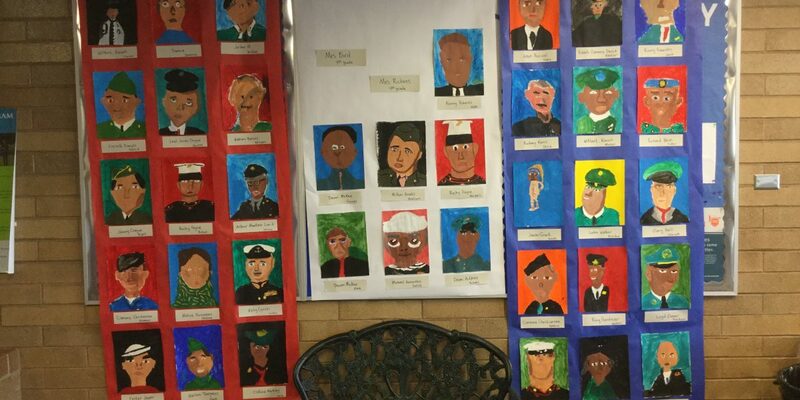 All students at Lapoint Elementary have spent the last five weeks working on portrait paints of Veterans from the local community. Images of veterans were provided by families, Robert Lucero – Veterans Director for the Ute Indian Tribe, and from various other sources including The Wall of Faces. The students started the first week by learning the proportions of the human face; following the ‘map of the human face’ to locate the placement for the eyes, nose, and mouth. The second week was spent identifying the features that makes each person look different, by drawing their own self-portraits using mirrors. They used the ‘map’ to find the location of each facial feature, but then to look closely as their own specific features that make them unique. Letters were sent home prior to the third week, requesting that families submit an image of a veteran their students would like to paint. Students that did not have a picture were invited to select a veteran of their choice from images provided for them. The students then spent the next three weeks drawing and painting the portrait of a veteran from their community. Every single lesson always started with a discussion of the different contribution these veterans have made to our lives and the freedoms we enjoy as Americans. The art work played an important part of the Veteran’s Day celebration held on November 12th, greeting the visiting veterans and families as they entered the lobby of the school. This is beautiful in so many ways! What a tribute to Veterans, thank you Melissa for doing such a meaningful project with your students. The portraits are lovely. This is really quite beautiful. What a wonderful way to honor veterans. Thanks Bruce. Every single student in the K-5 created a portrait. The students can choose what they do with their artwork, I know many parents have planned to frame them and give them to the vet as a Christmas gift. I had really wanted to get living veterans in for the students to draw from life (then work with a photograph for the painting part), but that only worked for one class. This project was an idea I read on some blog somewhere several years ago, but can’t remember to give credit.